This is a yellow sour cream pound cake. I used a 9 X 13 X 3 inches size pan. My husband carved the cake into a fish shape. Our inspiration was a rainbow trout. 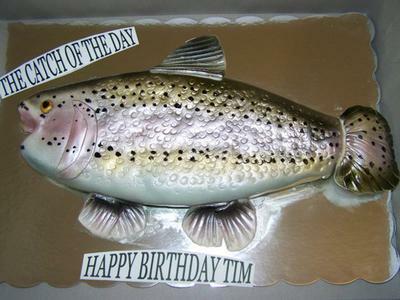 We had to adjust and make the fish a little fatter so the it would have more cake in it. After that, I covered the cake with butter cream icing and smoothed, ready for fondant. I left it alone for a couple of hours on room temperature while I was shaping the eye, fin , gills, and tail of the fish. I Afterwards, I fondant the cake. I also put the scales by using a drinking straw and making impressions on the fondant; I used the whole circle of the straw. I attached the gills, fin, and tail on the fish. I airbrushed the whole cake with silver sheen metallic color. Then I used the pink sheen color on the middle of the cake as well as the mouth, gills, and tail. I used a gold sheen for the upper part of the fish. At this point the cake looked a bit girly and it was for a male, so I added a bit of sheen black on the gills, tail, and upper part of the fish. I used a small brush to make the black dots all over the fish. Then, I attached the eye, I painted with a brush using the gold sheen color and put another black color for in the middle of it. YOUR CAKE IS GREAT. LOOKS SO REAL AND YOU DID A FANTASTIC JOB. I MADE ONE NOT TO LONG AGO BUT IT IS NOTHING LIKES YOURS. I HAD NO IDEA HOW TO MAKE IT. YOU ARE GOOD, !!!!! !